The Yousef Jameel Centre for Islamic and Asian Art provides online access to the Ashmolean Museum's Eastern Art department collections. As part of the University of Oxford, the collections hold particular value for teaching and research, but they also to appeal to visitors who may not be as familiar with the material. This project aims to open up the collections and enable everyone to find what they are interested in, whether for research, artistic inspiration or general curiosity. Eastern Art Online provides online access to more of the collections and contextual information than has ever been possible before. It launched in February 2010 to complement the Islamic and Asian Art galleries, which reopened in November 2009 following an extensive redevelopment of the Museum. 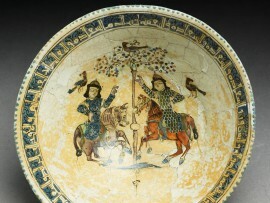 The online collection plays a vital role in providing extended access to objects that visitors would not otherwise see. Following an extensive programme dedicated to producing high-quality images and up-to-date information for the objects, it has eventually grown to include more and more objects from the Islamic and Asian Art collections that are not on display. This online resource is also designed to provide layers of information about the objects and the stories they tell. Just as the new galleries aim to highlight the connections between objects, to show how the civilizations that shaped our modern world developed as part of an interrelated world culture, this resource also hopes to enable further connections between objects through its browse and search tools and array of online collection themes. The project would not have been possible without the generosity and vision of Yousef Jameel, Hon. LHD, a dedicated supporter of the arts and a number of educational initiatives.